Music festival style — think crochet dresses, crop tops, and glitter makeup — has never been praised as being particularly tasteful. 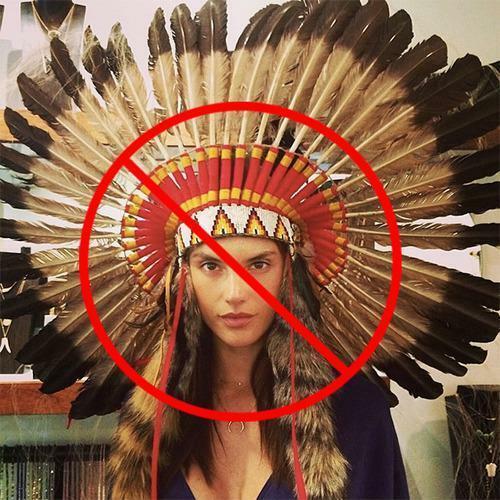 But one staple, the Native American headdress, is seen by some as an especially tacky choice — and now some organizers are banning it. The U.K.’s Glastonbury Festival decided this week that the sale of headdresses would be restricted on the grounds of the fest, and Canada’s Bass Coast Festival has forbid them entirely. 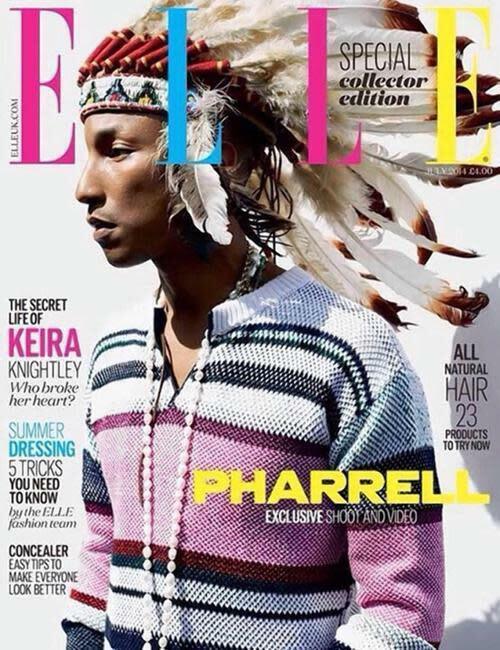 When producer Pharrell Williams posed in a Native American headdress on the cover of Elle UK’s July issue, fans voiced their displeasure with the Twitter hashtag #NotHappy, a reference to Pharrell’s recent solo hit. Williams issued an apology for wearing the accessory. “I respect and honor every kind of race, background and culture. I am genuinely sorry,” he wrote in a statement. And in 2012, No Doubt pulled a video for a single called “Looking Hot,” which had a Wild West theme and featured tee-pees, headdresses and smoke signals. In addition, Lana Del Rey, Khloe Kardashian, Ke$ha, and Urban Outfitters have all appropriated the look and been scolded for their actions. "I understand that we want to live in a post-modern world where we can wear a dot on our head or a sari, but the headdress isn’t a fashion item," Shorter says. "We have to resist turning the Indian into something silly or surface level." Jessica Metcalfe, Ph.D., author and owner of Beyond Buckskin, a website and online retailer dedicated to Native American artists and designers, agrees that headdresses shouldn’t be worn as a fashion statement. She tells Yahoo Style that Native Americans themselves have been asking festival goers to stop wearing them for years and is glad that the festival organizers are finally stepping in. "The festival organizers are starting to understand the sacred and important cultural aspects of the headdress and want to respect that however they can," she says. "However, on the other hand, we still have concert goers who think that wearing a headdress is not only acceptable, but is cool. Several Native American people have asked festival participants to not wear headdresses merely as a fashion statement, but our requests fall on deaf ears — which is unfortunate — but it is also great to have festival organizers align themselves with Native people on this issue."